You can watch as many documentaries as you like, read shelf-loads of books, and admire thousands of photos, but nothing quite compares with a trip to Skellig Michael. Boats to Skellig Michael run only in spring and summer; generally from May to September, so you won’t get to the Skelligs in winter. Indeed, weather is the main deciding factor for any trip to this isolated monastic outpost, so keep an eye on the forecast before you go. What may seem like a flat calm day when you arrive in Portmagee may turn into a dangerous swell by the time you reach Skellig Michael, so be advised that your skipper will rely on years of experience and careful monitoring of weather conditions before making the decision to head to the island. Getting to the Skelligs requires advance planning and good weather, but once you have your boat tickets booked and the weather gods smile on you, prepare for the voyage of a lifetime. On the 45-minute boat trip, you will pass the “snow”-capped Little Skellig, home to thousands of nesting (and very loud) sea birds, particularly gannets, who have made it the largest gannet colony in Ireland. You may also see other marine life such as seals, basking sharks, and Minke whales. 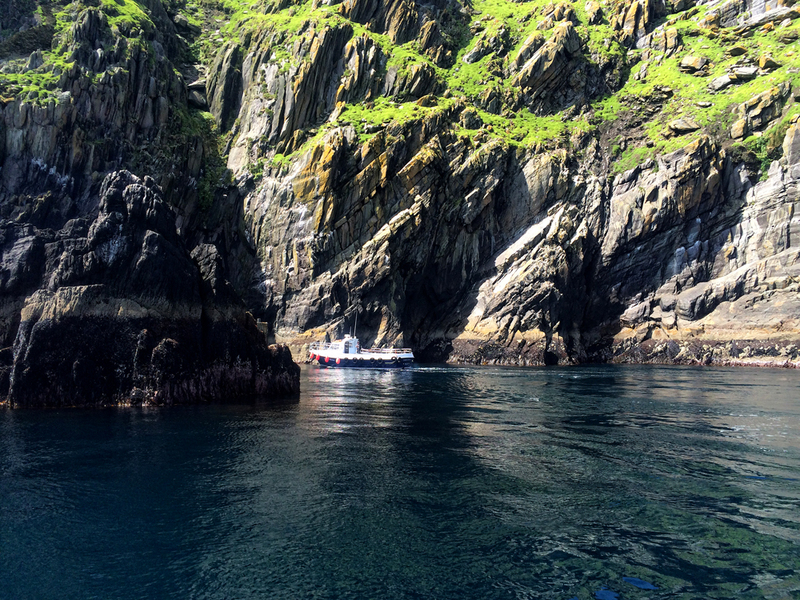 When you reach Skellig Michael, be sure to listen carefully to your skipper’s instructions, as disembarking onto the island requires your care and attention. You will make the return journey about 2 ½ hours later. In the intervening time, you can be assured of one of the most memorable experiences of your life.